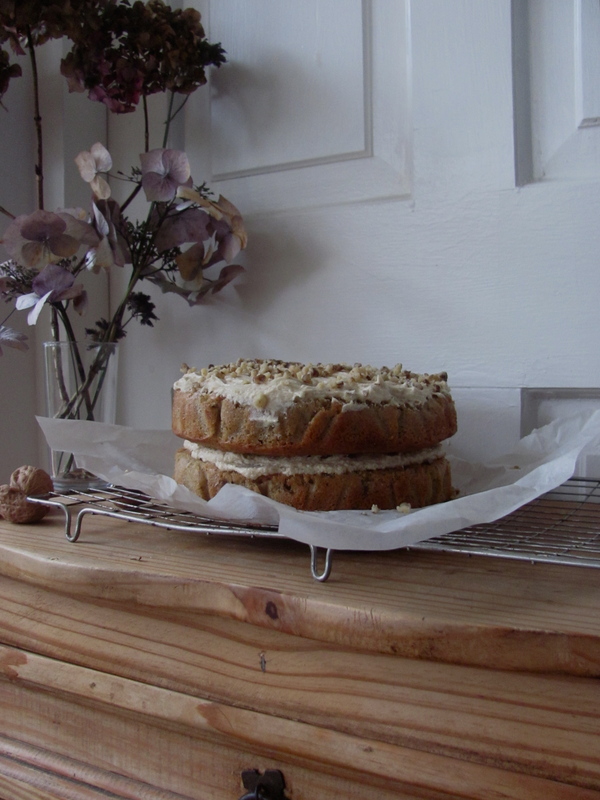 Just a quick post with my favourite coffee cake recipe, made with espresso coffee and walnuts. It’s from Simon Rimmer, a BBC Food stalwart, and it’s as delicious as it is easy. I used some freshly-shelled walnuts, which quite often sit around the house at this time of year but they’re definitely not essential. Just make sure whatever walnuts you use smell and taste fresh with no acrid or bitter flavour. Try and use nice coffee though – our Irel coffee syrup days are fortunately long behind us. – Preheat the oven to 180 degrees and line two sandwich tins with parchment. In a mixing bowl, beat the butter and sugar together till fluffy and pale. Add the eggs, one by one, incorporating each fully into the mixture before adding the next. Add the espresso and a drop of vanilla extract if desired and mix in fully. Fold in the flour and walnuts. Divide the mixture between two 20cm sandwich tins – mine were smaller than this – and bake for 25-30 minutes, or until golden brown, springy and a skewer comes out clean. Transfer the cakes, still in their tins, to a cooling rack. After 5 minutes, remove from the tins and leave on the cooling racks till they are fully cool. For the icing, sieve the icing sugar over the softened butter and beat until smooth. Add the espresso and continue to beat. If the mixture looks like it has separated slightly sieve a little more icing sugar in, mix well and smooth over the cakes when they are fully cool and sandwich together. Decorate the top either with chopped walnuts or carefully placed walnut halves.